​In the second reading today, we hear the moving words of an imprisoned old man to a young leader in a fledgling community. As any parent places hope for the future in his or her child, Paul here looks to a new generation of witnesses to the Lord. Paul has sacrificed everything for the sake of that witness and now he must entrust it to others. In his very emotional appeal, he offers the heart of the matter. Paul has endured, sacrificed, and poured himself out in the service of the gospel. This has only been possible because Paul has united himself entirely to the Lord Jesus. In that communion with Christ, Paul has found grace and mercy. With all his being, he summons those who would share in the witness to do likewise. That communion will bring its share of dying, but it is above all the path to God and to authentic human living. Even chains become irrelevant in the renewed human life made possible by the grace of Jesus. Notice that the letter calls Jesus “a descendant of David.” The effects of the Christ event have the utmost significance for all humanity, but the story begins with the particular rather than the universal. Jesus is not a mere generic ideal, he is a real man with a culture, ethnicity, and heritage. This issue of the universal significance of the Jewish Messiah is the reason behind the pairing of the readings from Second Kings and the Gospel of Luke. The passage from Kings concerns Naaman, an army commander from the foreign land of Aram who came to Israel because his Israelite serving girl told him of a prophet who might cure him of his leprosy. The king of Israel feared the visit of the general as he could not imagine how Naaman might be cured and feared that the failure would serve as a pretext for invasion. The prophet Elisha sent word, and Naaman obeyed Elisha’s command to bathe in the Jordan seven times and has been cleansed of his leprosy. Desiring to honor the God who saved him, Naaman made a strange request - asking for two mule loads of earth to take back to Aram so that he might properly worship the Lord. Naaman believed that he could only worship the God of Israel on the land of Israel. Ancient peoples believed that gods were particular and local. Each god had authority over a particular territory and the people that resided within the territory. But the very healing of Naaman, a foreigner and military leader of an enemy nation, revealed that the Lord of Israel was not like the other gods. Adonai did not reside in the soil of the land of Israel, it was He who gave the land as a gift to the people. He might dwell in their midst, but He was not confined to their territory. Furthermore, this God claimed sovereignty over all peoples. Even in His choice of the people of Israel, His purposes were for the long term salvation of humanity itself. At the very beginning of the story, Abraham was told that his family would be for the blessing of all the nations. The prophets spoke a similar message to Israel time and again – denying them the temptation to think that God’s choice of Israel entitled them to superiority over other nations. Having said all this, we also have to acknowledge that the general cannot exist without the particular. Can you really love people? Or must you first love a person in order to understand and extend such love in general. And so God’s plan involves the choice of a people who will be the wellspring from which the Messiah would come. Among the descendants of the beloved David, we find the one Who is both Son of David and Son of Man. He is both the Messiah long awaited by Israel and the One Who inaugurates the salvation of the nations. It is this second part that finds emphasis in the passage from Luke. 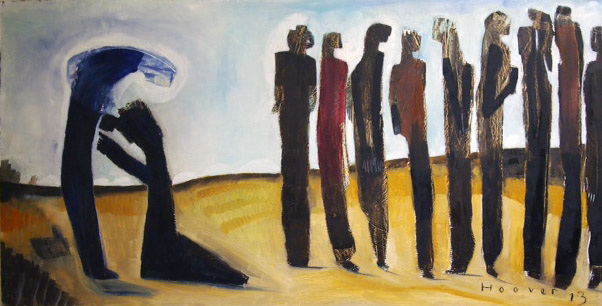 We hear of the healing of ten lepers and only the foreigner returns to glorify God and thank his deliverer. To this foreigner, Jesus announces salvation. He has liberated a man from a terrible disease that robbed him of good health and the comforts and aid of community and family. The man was as the living dead, walking the earth but outside the world of the living. As Jesus restores him to physical health and the society of men, the more important transformation is found in the man’s relationship to Jesus. His gratitude is the beginning of a faith that makes foreigners brothers and restores human beings to right relationship with God. The descendant of David has become the Lord for all. Today, that promise belongs to us. We, from many peoples, become one people. We witness the miracles of healing, we know the saving power of the Lord. And we have the promise of a land where the blessing promised to Abraham and his descendants will endure forever.